Launched in 2013, HeartSafe Community (HSC) is an initiative led by PHCD to strengthen our community’s response to a cardiac emergency through CPR /AED training, strategic AED installation, maintenance and registration, and heart health education. HSC brings together local police and fire departments, emergency medical transport providers, hospitals, schools, non-profits and the American Heart Association to work together reduce deaths from cardiac emergencies. The HSC program has been developed using California Health and Safety Codes Title 22 for Public Access Defibrillators, California Senate Bill No. 658, local Emergency Medical Services (EMS), FDA, OSHA, and the policies and procedures maintained by Healthquest under the guidelines of the American Hearth Association. The HSC program is managed by Healthquest CPR, an authorized training center of the American Heart Association and service of PHCD. This year, over 300,000 Americans will be victims of Sudden Cardiac Arrest. According to OSHA, Sudden Cardiac Arrest (SCA) is the leading cause of workplace death, killing 10,000 American employees annually. Immediate CPR and AED deployment within 3-5 minutes of collapse increases SCA survival rates by as much as 70%; survival rates with CPR alone are about 7%. You can protect the health and safety of your employees! Because most cardiac events happen in the community and at home, CPR training is a benefit that goes beyond the workplace. Petaluma-area businesses have joined HSC to ensure workplace safety and support Employee Wellness programs. Our HSC staff will work to meet the unique needs of your business and ensure the safety of your staff! Did you know? Beginning in the 2018-19 school year, all California public schools requiring health education for graduation must provide Hands Only CPR training as part of their student instruction. Our HeartSafe Community Schools program and staff can help you be prepared and compliant with the law! Sudden Cardiac Arrest (SCA) in not only the number one cause of workplace death, it it also the number one killer of student athletes. Every three days, a student athlete will lose their life to SCA. Fortunately, you can make a difference and raise survival rates from just 7% to 70%. You can help protect your staff and students. HSC is partnering with schools throughout the North Bay to ensure students and staff are ready to respond to an SCA. Becoming a HeartSafe Community School means your campus will be equipped with CPR/AED certified staff, an accessible and maintained AED, a Cardiac Emergency Response Plan (CERP) and Cardiac Emergency Response Team (CERT), and education and outreach materials for students, staff and families. 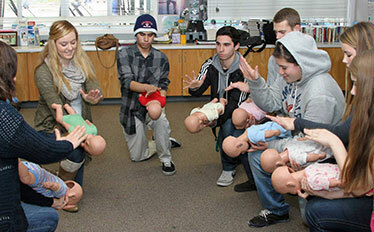 We also offer Hands Only CPR and AED Training and CPR Certification for students. This life-saving skill will prepare students for real-world careers and programs that require training or certification. We are proud to report that in 2016, every school in the Petaluma area as well as Shoreline Unified School District became a HeartSafe Community School. There are now a total of 31 HeartSafe Community Schools in our service area! Not only are these campuses prepared to save a life of a student or staffer, but our kids are saving lives out in the community! 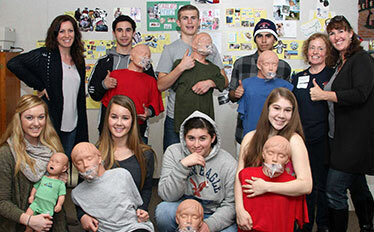 Click here to read more about the life-saving students of Petaluma. 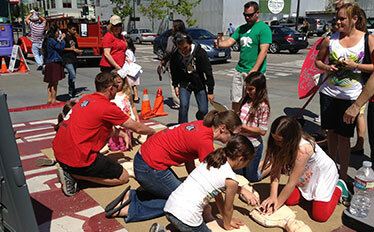 Everyone can play a role in making Petaluma a HeartSafe Community. Email us at healthquest@phcd.org or call us at (707) 766-9226 to learn about how you can get involved. How can I get CPR and AED training? Click here to register for a class with our AHA-certified instructors or contact Healthquest at healthquest@phcd.org or (707) 766-9226 to learn more. How can I purchase an AED and maintenance plan? We sell AEDs and maintenance plans to make sure your business or organization is rescue ready! Discounts on CPR training, AEDs and replacement parts are available. Contact Healthquest at healthquest@phcd.org or (707) 766-9226 to learn more. What if I already have an AED? If you have an AED, the HSC program can assure your AED is maintained and is rescue ready. To find out if your AED is in compliance with state and local regulations, order replacement parts or if you have questions, contact Healthquest at healthquest@phcd.org or (707) 766-9226. I want to provide training to my staff, but don't have the resources to provide CPR certification. What can I do? Congratulations for understanding the importance of cardiac emergency response preparedness in the workplace! While we encourage all individuals to get full CPR certification, we understand that time and financial limitations may make full certification difficult for businesses and organizations to provide to staff. We now offer a 30-minute Hands Only CPR Training and AED Demonstration course to those looking for a shorter and more affordable option. For more information, please check out our course listings and contact Healthquest at healthquest@phcd.org or (707) 766-9226.